The mini skid steer fork attachments are tough and built for picking up, moving, lifting and carrying lots of materials. When needing to fork and transport loads fast and easily around the farm, garden or building sites, our mini skid steer range of forks are the perfect attachments for these tasks. Our selection of forks are ideal for equestrian uses such as mucking out stables, moving manure, hay bales, straw, grass and much more. 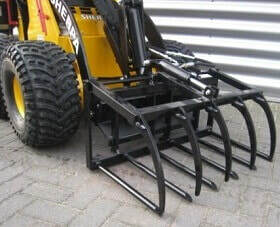 These mini skid steer forks are also suitable for the 150-mini loaders. Other fork attachments available are our mini skid steer pallet forks designed for moving and lifting pallets. 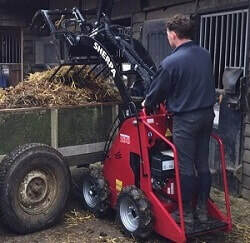 ​The mini skid steer forks are designed for moving manure, straw, hay, grass and other bulky loads, making them ideal for farms and equestrian users. These mini skid steer fork attachments are not suitable for picking hard objects such as wood or stone. The forks are compatible with the 150-mini loaders. These mini skid steer pallet fork attachments will lift small pallets and transport them to the required location with no effort required. Some uses for the pallet fork attachments include hauling out big logs and fence posts, lifting and stacking hay bales and a lot more. The mini skid steer pallet forks have a maximum lifting capacity of 350 kg. 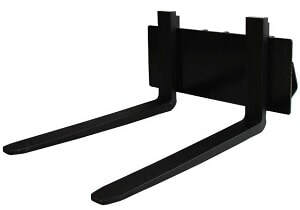 These mini skid steer forks can be used with the 150-mini loaders.